But first, a big thank you to TelmaQ and Gardienne for offering to be my volunteer editors. Ravelry is all set with "Ampersand (upside down)" thanks to them. Plus, LavenderSheep managed to get "Mom's Fixation" reassigned to my authorship. At last check, my recent pattern is on 68 Ravelers "to do" lists! I couldn't be more thrilled!!! Thank you on e and all!!! 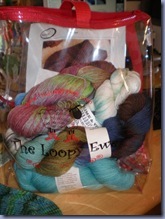 The deal was...finish the pattern, unwrap the Loopy Ewe tote. So what was in the tote? Let's take a look! 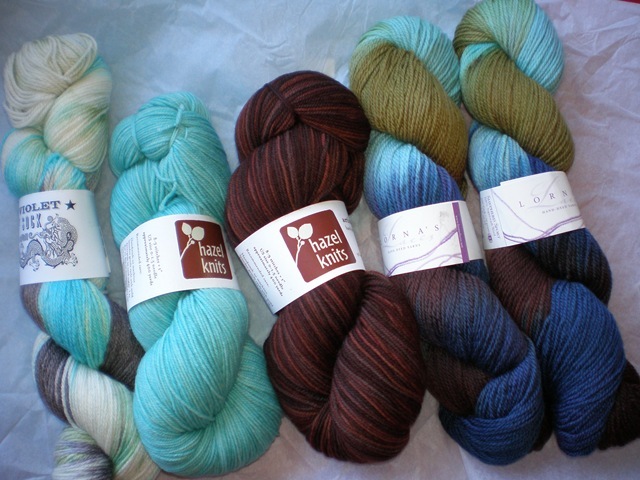 Left to right: Lime N Violet's "Happy Bruise", Hazel Knits "Beach Glass", Hazel Knits "Chocolatier", and the Lorna's Laces Shepherd Sport "Edgewater". Not shown: Tessarae sock pattern from Knitspot. But wait, there's more! This was my sixth order from The Loopy Ewe. That means that I am now a "Loopy Groupie". That also meant Loopy Groupie welcome gifts. Hopefully, I won't have to stage another "fiber hostage situation" any time soon! STR is awesome as far as it's texture is concerned. The skein has a very nice twist that doesn't allow the fibers to split while knitting and it creates a dense fabric. It was incredibly smooth to knit with. These are fabulous features! Since I was commissioned to knit these, I made them for US shoe size 8-9. 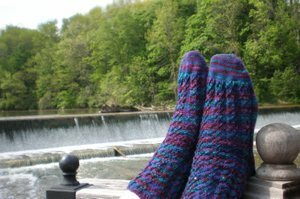 It was a good thing that I hadn't planned to knit them for my "canoes" (size 11)! There was a moment that I was seriously worried that I would run out of yarn. In the end, I was left with a meager 5 yards of yarn. (Medium weight has 380 yds vs. light weight's 360 yds.) 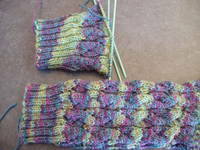 Thankfully, I prefer a shorter cuff (4.5" vs Jaywalker 6.75") so I shouldn't run out of yarn for the pair that I'll make for myself. The final issue is price. 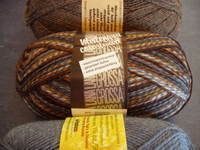 Light weight is $19, Medium weight is $21.50, and Heavy weight is $27.50 per skein. For myself, I think medium weight is going to be what I would use most often. However, at $21.50 for a pair of socks...they would only be made for VERY special people or as a self-indulgence. Yes, the colors are outstanding. (The color for this pair is called Ruby Slippers but it looks more like it should be called Chocolate Covered Cherries!) Yes, the yarn was awesome to work with. However, my yarn budget is not to the point that I could knit exclusively with Socks that Rock (or even Lorna's Laces which is another fine sock yarn). I have to admit that it would be tempting to buy all the pretty colors that are out there but I'm still on my sock yarn diet and exercising willpower. (Yes, I'll use that word again. Even though many of you didn't help my resolve yesterday! I did manage to resist the urge to order yarn.) If money were no object, I could easily see my stash become "heavy" with Socks that Rock and Lorna's Laces. 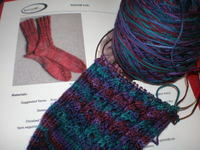 Last night, I cast on the second Sock Bug sock and headed out to meet a group of fellow knitters. The three of us headed to Bahr Creek last night to check out their knitter's gathering. Everyone was very welcoming and we had a nice time. Thanks guys. You know how it goes when you knit in a gathering where the conversation is good. Well, maybe too good judging by my knitting. First, I'd notice a mistake I'd made with the pattern and tink back to fix it. Then, this morning I noticed this... a large pool of green on the sock. It striped so nicely on the previous sock. How'd that get there!?! Oh yeah, I've had this happen before...Gauge Gone WIld. Now, I know there are those of you out there who would say, "But Krafty1, Lorna's Laces does have the occasional pooling problem." I'd agree with you except for the fact that the striping resumed it's normal path when I returned to it today. Since these are a gift for a dear friend and there won't be a lot lost, I'll take the large pool of green to the frog pond. It's okay, I had a good time AND I will have to remember to watch my gauge (or knit things where gauge is not an issue) the next time. 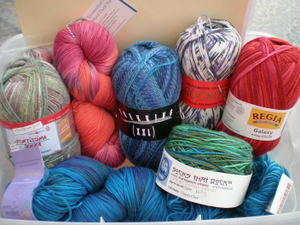 Last night, I also picked up a skein of sock yarn last night (it's the one in the middle). Notice it was "picked up" not "bought" (remember...I'm on a sock yarn diet!). I exchanged a skein of yarn that I'd previously purchased for my SockPal but didn't use. I was hoping to find something to blend with the brown and blue that are already in my stash. This skein fit the bill perfectly! "Why" you ask, "do you need a striped yarn?" Well, I notice a beautiful sockon Monica's blog! Her beautiful sock turns out to be the kind of ugly green toed sock from the cover of Sensational Knitted Socks. I like Monica's version SO much! (AmyL: this is the sock I was telling you about last night.) Now I just have to decide a) whether I'll use the blue or the brown to go with the striped yarn when I knit these up and 2) where on the growing list of projects these socks will go! I have a Three Sweater Rule. I can't have yarn for more than 3 sweaters at a time in my stash. That forces me to knit things up in order to purchase more. The added benefit is that the sweaters are "fresh" when I knit them instead of something that's been hanging around forever. I've managed to stick to this rule. Sock yarn, however, is where my weakness lives. Up until the start of this year, I couldn't walk out of a yarn store without at least one ball of sock yarn. Then, when I decided to move my sock yarn stash to a new home where I could easily "see" what I had, the brakes came on and the self-imposed Sock Yarn Diet began. There was the Ebay Lorna's Laces purchase (5 pair). 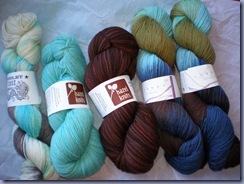 And then there were the skeins that I "needed" (3 pair). (Including the blue shown here- purchased this past weekend- that I want for Embossed Leaves.) Plus, the rust Koigu (also shown here) that Mom thought I should adopt. I shudder to imagine what the stash would look like if I weren't dieting. I don't think any of you will be dismayed when I say that the diet is definitely OFF while we're in Europe. I have another reason for celebration today. I won, I won...an Ebay auction. No Judy, it was not for sock yarn. My diet is still intact. 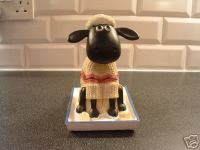 It was for this Shaun the Sheep Ceramic Money Box. It's coming from the UK and it's all Amber's fault. She sent me the Wallace & Gromit Tea Tin for my birthday. I was writing her thank you note and couldn't remember the name of the sheep (Shaun). I Googled and found the name, which led me to the bank. I should probably use it to save money for sock yarn whilst on my Sock Yarn Diet. I hear another celebration coming in the future. In the meantime, Dharia- your schoolwork SHOULD come first and I will continue to cheer you on to the finish line. Mothlady- thank you for your words of encouragement. Your Lillehammer makes my St. Moritz look like a cake walk. I bow to your efforts. Hopefully, you had a wonderful weekend to work on your sleeves. We can cross the finish line together. I can hear you now, "Go! Grab your tails and weave them!" Thanks guys! The good news is that I got the Cookie order completed last night. The bad news is that I didn't knit a SINGLE stitch on Friday. Not one. I didn't even cast on the tulip socks. I'll have to mark it on the calendar. I rarely miss a day of knitting. Then again, athletes in training will incorporate an "off" day. That's it, I took the day off as part of training. Then there was a great article in the Milwaukee paper that my brother sent to me. In case you missed it, the JournalSentinal article was about an 80 year old woman who knits hats for kids as an incentive to get them to read. There is a super picture of the kids in their hats. (Go ahead, check it out.) What a great idea! There are so many ways that knitters get involved in making a difference in the world. I'm anxious to add something to this blog toward that end also. I know what you're thinking, I thought it too; What about the Sock Yarn Diet? Well, a means to an end, right!?! 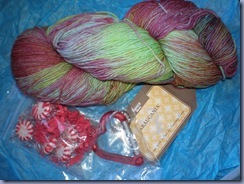 If I buy this skein, I'll be able to knit the socks that use two other skeins. Lets recap, Jan 1 - yarn for 25 pairs of socks. Socks knit- 3 pair. Yarn purchased- 7 pair. Let's hope the year doesn't continue this way! File it under best laid plans. Here's what arrived in the mail Thursday. This is what happened. As part of my New Year's Resolution I planned to knit my way through my sock yarn stash. No more purchases until I'd completed knitting up socks from what was already in my stash. Okay, I wasn't specific about NOT purchasing new sock yarn until all most of the old sock yarn was gone. But, that was what I had intended. I finished the socks for my husband and was on my way. Then I was tempted by the Tess yarn for a friend's birthday. It was only one skein. Hey, I was back to where I started. I could still knit my way through the stash. But then IT happened. I received an email from Ebay reminding me that it had been awhile since I'd ordered sock yarn. "Please come back", it begged. Well, what would it hurt to look!?! So I looked and saw a skein of Lorna's Laces that looked SO yummy. I placed my bid. It's not like I win these things on the first bid anyway. I bid on it like the person who purchases a lottery ticket; not planning to win, but just imagine what winning would mean. I won. What!?! Oh look, the Seller has some "Buy It Now items" AND will combine postage. Well, maybe I should take a look and make it worthwhile. Bad Dieter! The funny thing is that the one color that started this whole "binge" is probably the one that I like the "least" of all of them. Darn that Ebay! What's the saying, "Lead me not into temptation, for I can find it on my own." This is going to put a dent in this weekend's shopping in Madison.